Born in Waterloo, Iowa, on July 10, 1935, Joyce Sherburn Mills graduated from nursing school in Chicago and embarked on a more than 50 year working career in healthcare. After moving to California she worked for more than 20 years at St. Joseph's in Burbank as lead surgical nurse in a pioneering heart surgery center. When the activity was moved to Good Samaritan Hospital in Los Angeles Joyce went along, and continued to work at "Good Sam" until her death. Along the way she occasionally served as a flight nurse for Schaefer Air Ambulance, the first such operation in America, flying out of Van Nuys. From time to time she would relate some -shall we say- interesting stories of those activities, and those days no doubt were a factor in the development of her own avocation as an aviatrix. Contact with the Van Nuys aviation crowd also brought her into the orbit of Don "Muldoon" Alderson , who became her longtime companion. The combination of the super-sized Alderson and the petite Mills led to general use of the sobriquet "Muldoon & the Midget", which she hated but accepted -generally- with good grace. Joyce and Muldoon were among the Skypark's first residents. With smoke-equipped his-and-hers T-34s augmented by Joyce's A-36 Bonanza they were a fixture in the skies in and around the Skypark. Both were active in the close-knit T-34 world. Don, plagued by diabetes, gradually became unable to fly himself and had to sell his T-34, but Joyce was able to keep him airborne and shuttling back and forth between Rosamond and their riverfront home in Bullhead City. She also started commuting by air to her job at Good Samaritan Hospital in Los Angeles. Upon Don's death in September of 2001 Joyce continued to work and to fly. By now a daily commuter in the A-36 or sometimes the T-34, in the last years she nearly always beat my C182 off the ground and became the "first call" alarm clock for many in the Skypark. When I retired from the productive life in 2002 Joyce was for several years our only regular airborne commuter. 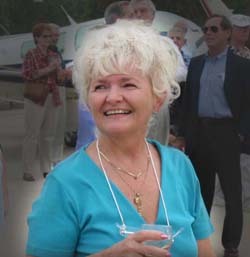 Joyce had many interests and talents outside aviation and her professional career. An accomplished artist, several of her paintings were prominently displayed in her home. She was also an amateur Egyptologist and made several study trips to Egypt. A sideline of this interest was belly dancing, and she was active in a Los Angeles dance group for many years. She also did professional-grade cake decorating for friends and for enjoyment. Joyce was one of those unique persons who made an big impression without being an in-your-face character. Her manner of passing fit her character precisely. Although plagued by cancer and suffering through both chemo- and radiation therapy she kept on, hiding her problems from the world with a cheerful face for all. Even at the end she insisted upon the lowest possible profile, so much so that most were shocked to learn she was gone. I am not a religious person, but it would please me greatly to find she is, indeed, soaring around those clouds above Paradise at the controls of a plane that never has an oil leak or needs an annual.